What I heard was GM’s strategy of getting many people from across the company involved in social media. “I would much rather have 400 people from General Motors out there in the organization with 150 followers each than ever want me with 40,000” stated Mr. Barger. The made me wonder: Does that approach make sense? Isn’t it a bit inefficient to have 400 people on social media platforms communicating for the company? Is there a benefit to having a mass of employees on a social networking platform like Twitter? 1.) Reach: Reach is the idea of extending your audience of listeners and participants. Some believe having many brand representatives extends the network of communications. 2.) Relationships: Each person from the company is a contact and that contact will create personal relationships that extend beyond a corporate branded Twitter ID like a @GMBlogs or @Chevrolet. A person personalizes the company. Do you really need 10s or 100s of people representing a brand? This is not so clear. Let’s look at GM’s common relationships across its many Twitter accounts. 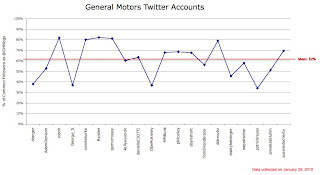 The graph below shows several of the company representatives of GM on Twitter and the percentage of common Followers with the @GMBlogs corporate branded Twitter account. A high percentage shows the personal account has little additional reach over the brand and is unnecessary if the purpose is reach, since followers are already engaged with the company. What is also apparent is when someone has a relatively low percentage of overlapping followers. There are a few people this applies to. Chris Barger (@cbarger): As the lead social media person for the company, Chris does a lot of outreach with bloggers, media, and social experts at many events across the country and those relationships extend his reach beyond someone who just wants to know the latest from GM. George Saratlic (@George_S): George is the Canadian version of Chris Barger (I know I’ll get corrected on that oversimplification.) With a different country in scope, he naturally appeals to a somewhat different audience and like Chris Barger, is involved in a lot of events that extend his Twitter network. Patrick Reyes (@patrickreyes): Patrick is not part of the Public Relations team. He does marketing for the Buick and GMC brands. His reach is a bit more broad probably due to his interest in social media discussions and personal connections in his interests less than the Twitter account being all about work. His profile also doesn’t talk so much about what he does for GM or if he even works for the company (he does) so that may be a reason for less overlap with the brand account. Adam Denison (@AdamDenison) & Lesley Hettinger (@lesleyhettinger): Adam is the product communications lead for the hit Chevrolet Camaro and Lesley does the same job but for the Chevrolet Cruze. With two big product launches demanding a lot of attention these two brand representatives will appeal to the product followings possibly more so than the primary brand’s following. Personalizing relationships is a very important aspect of social media. Many debates on this topic have led to supporting the idea that names behind a brand betters the connection, since there is a real sole person behind the brand instead of just a logo. Knowing a real person also presents a personal touch with a real face and common voice. Keeping it personal helps a lot with brand image on a platform like Twitter. A lot of companies build a team of experts and go to them for all social needs in an organization. The approach of isolating your social media people to a dedicated group does “lessen the likelihood of really dumb mistakes,” according to GM’s Chris Barger. The problem: It also makes any learnings come from the social media expert and not from another engineer or marketing person. So the social media expert becomes a conduit for third-party feedback that may not be heard by non-peers. I do find GM’s approach of getting many participating in social media a great way to expand the knowledge and understanding of this new communication method impressive. I have also seen first-hand how influencers in the automotive industry gravitate to different GM representatives which increases engagement and a relationship with the brand. There is some inefficiency, especially with accounts where there is a lot of overlap in what is being said, like said image at left, and not a lot of additional information is getting out about the brand. That said, the benefit of having your fans and influencers establish personal relationships with representatives they develop an affinity for is strong enough to not be concerned with the redundancy. Just understand there is some inefficiency with the GM approach if the people do not have a clear distinction from the general corporate account. Hey Chris - thanks for the analysis - and especially the graph charting extended reach (or lack thereof). Really solid thoughts. One thing I said that I think is critical is this: to effectively incorporate feedback from the outside audience into your organization, it's really important to not have it bottlenecked with just one or two people; that kind of makes the incorporation of audience feedback dependent on the schedules & bandwidth of those one or two (not to mention making it dependent on the credibility of those people within the rest of the organization). I don't think social web activity is limited to "humanizing the brand" or engaging in conversation; to truly do it "right," wouldn't we want to be trying to get as much responsiveness and audience feedback built into the business as possible? Anyway, I really appreciate your analysis of both our approach and specifically of my presentation. Have a great weekend! I have to agree with the "distributed approach." My way of saying it is, "On the Internet, 1,000 little things will always be better than one big thing." Thank you for the emphasis on something I only mentioned briefly. I agree there is a lot more influence inside an organization when the people involved in certain disciplines participate in social media and are the ones coming back to their internal teams with feedback; instead, of some 'social media' person showing up saying what needs to be done. Besides there are definitely communication bottlenecks that occur when only a small team make up the audience feedback team. 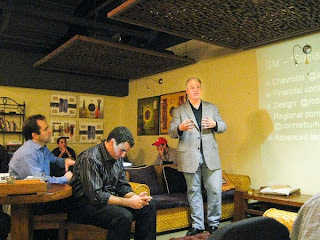 Thank you again for an excellent presentation at the Social Media Club of Detroit and for being an excellent steward of GM's social media efforts. And to Rich Ullman, I appreciate the positive comment about the article and good to see some more support for a distributed approach. Thanks for the analysis I have to agree with the "distributed approach"